As mentioned in the previous post, the Croakey Conference Reporting Service is covering the NACCHO Aboriginal Community Controlled Health Service Summit, which starts in Adelaide today on Twitter, check#NACCHOSummit). In the conference preview below, Lisa Briggs, CEO of NACCHO, has an online chat with Croakey about the “bang for the buck” provided by the Aboriginal community controlled health sector. She also reveals her dream panel for ABC TV’s Q and A program, her enthusiasm for the power of social media, and her hopes that more young Aboriginal and Torres Strait Islander people will choose careers in health.Lisa is a Gunditjmara Aboriginal woman from the western district of Victoria, and an Aboriginal Health Worker who has worked in the health field for the past 25 years, mainly within the Aboriginal community controlled health sector. ***Q: A Twitter campaign is pushing for the ABC program Q and A to have an all-Indigenous panel. Who is your dream Q and A panel? Justin Mohamed, Chair of NACCHO – to highlight the importance of Aboriginal health and how the Aboriginal Community Controlled Health model is contributing to Closing the Gap. Warren Mundine – who would Chair the Prime Minister’s Indigenous Advisory Council should the Coalition win the election. Marion Scrymgour, CEO of our member service Wurli-Wurlinjang Health Service in Katherine. Marion understands the political and health system and would be able to provide another opinion and challenge ideas, as well as provide gender balance. Shane Houston from Sydney University – his extensive knowledge of Aboriginal affairs is impressive and he would provide a sense of the vision and systematic changes required. Professor Patrick Dodson – his extensive knowledge on current issues such as Constitutional reform and land rights. Pat Turner – Former Deputy Secretary of the Prime Ministers Department – has extensive experience in government and Aboriginal affairs. I wanted to put Marcia Langton and Noel Pearson in there too, as I think they all have something to contribute on how policy is being formed for Aboriginal people and the impacts that it has on us and our environments of urban, regional and remote…I think people expect Marcia, Noel and Warren to all be part of this should the Coalition win the election, so I thought what other Aboriginal leaders have equal experience but are not always heard and these are the ones I came up with my shortlist. Q: You tweeted from a recent AHMRC meeting that the three C’s of the Aboriginal community control philosophy are “Community-initiated”, “Community-driven”, “Community-owned”. Could you explain why each of these C’s matter? Lisa Briggs: It’s about self-determination of Aboriginal and Torres Strait Islander people and their fundamental right of being part of all processes that have impacts on us. Aboriginal Community Controlled Health Services are founded on this basis. NACCHO has recently released the Aboriginal Community Controlled Health Services Report Card, which signifies that when Aboriginal health is in Aboriginal hands we can make a real difference to Closing the Gap. 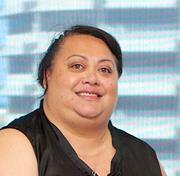 Q: The NACCHO Summit aims to profile innovation and best practice in the community controlled sector. Can you give us one of your favourite examples of this? Lisa Briggs: It wouldn’t be fair for me to pick one over the other. However, I can say this – how very pleased I am to see the Aboriginal Community Controlled Health Services put in so many conference abstracts to this weeks summit that will show innovation and best practice from all over the country. With over 300 delegates registered, over 85 presentations and over 100 speakers and exhibitors, it is going to be a great event. This is a good example of “the 3 C’s” as this event is not government funded but has been self-funded by our sector showing how NACCHO, affiliates and member services continue to support each other. The summit themes of governance, workforce and comprehensive primary health care will show the diversity amongst the membership. There will be common things we can all relate to, however it will be innovation at its best that the members can take back to their community organisations. Q: What are the barriers within government & government policy to the community controlled sector achieving its potential? • Constitutional recognition that Australia’s first people are Aboriginal and Torres Strait Islander people who are rich in culture and knowledge – something all Australia should be proud of. Q: What are the barriers within the community controlled sector to the sector achieving its potential? • A lack of appropriate funding to enable the ACCHS to meet the needs of communities. • Government policies that are not targeted to the needs of that community. • Workforce recruitment, retention and capacity – particularly GPs, nurses and allied health workers. • Lack of genuine partnerships. • Lack of scholarships that support and meet the demand required for Aboriginal and Torres Strait Islander people to join the health workforce. Q: What are the barriers within the wider health system to the community controlled sector achieving its potential? • A lack of capacity to meet the needs of Aboriginal organisations and Aboriginal & Torres Strait Islander people. Q: What are the barriers within Aboriginal and Torres Strait Islander communities to the community controlled sector achieving its potential? • Housing – having the same level of opportunity as other Australians to either purchase or rent. Q: What are the enablers within government and government policy and the wider health system to the community controlled sector achieving its potential? • Genuine engagement and consultation and being heard and listened to. • Working alongside Aboriginal leadership at all levels for development, implementation and evaluation. • Genuine partnership, opportunity and investment in what works for Aboriginal and Torres Strait Islander people. • Close the Gap Statement of Intent is a good example of what can happen when this above process is followed. However, there is always room for improvement. Q: What are the enablers within the sector to the community controlled sector achieving its potential? • Investing in Aboriginal leadership as part of professional development. Q: You’ve been known to say that the community controlled sector offers “the best bang for the buck”. Can you quantify this? Lisa Briggs: Aboriginal Community Controlled Health Services are not funded to the same level as other primary health care services across Australia. However, they are the only services that demonstrate and are targeted towards health gains – not throughput. This is why the Aboriginal Community Controlled Health Services Report Card is so significant, as we now have an evidence base that can be showcased. Q: How would you advise community members to evaluate the quality of their community controlled service? What are the signs of a healthy service? And what are the signs of a service that needs support to improve? Lisa Briggs: All of our Aboriginal Community Controlled Health Services are accredited and meet the Australian Standards and part of the process is to receive feedback from the clients you service to measure quality. This has now been embedded as custom and practice, and allows the ACCHS’s to work on a continuous quality improvement model. A healthy service in my opinion is one that follows “the 3 Cs” (ie “Community-initiated”, “Community-driven”, “Community-owned”). The issues that services face vary: it might be a small service needing more capacity and expansion, it might be a large service needed to review its strategic direction, it might be a young community needing guidance. Q: In a recent speech on the social determinants of health, AMA president Dr Steve Hambleton acknowledged the impact of institutionalised racism. The vision of the new national plan for Aboriginal and Torres Strait Islander health (which recently had a positive wrap in The Lancet) is for a health system free of racism. For health services and health professionals that want to address this problem, how would you advise them? Lisa Briggs: Engage with their local Aboriginal Community Controlled Health Service and learn about what the communities’ needs are, ask how they can assist in a genuine partnership and coordination model – it will take shape from there over a period of time. Q: What is your vision for Aboriginal and Torres Strait Islander health in 10 years time? Lisa Briggs: I believe if we currently keep tracking with our original health targets, then life expectancy should increase. However, some areas need urgent attention now, such as diabetes, renal disease and cancer. We are moving into a world where everything will be more telecommunication-based with telehealth and ehealth. With workforce shortages and population growth, models of services will also need to adapt, to continue meeting the needs of the community. Since we are a young population compared to the rest of Australia, I hope to see more of our young people complete their studies, and find their career pathway into the health system. Economic constraints will create challenges and opportunities. The challenges include that NACCHO, affiliates and members are not funded at parity as the rest of the health system. A potential opportunity is that Government may choose to invest at a higher level or to buy more services from ACCHSs given the good value they provide. Q: What is your vision for the community controlled sector in ten years time? Lisa Briggs: Aboriginal Community Controlled Health Services are viable and sustainable, and their model of services adapts to suit the changing needs. This vision is outlined by the NACCHO 10 point plan, which gives focus and direction to us, our affiliates and member services. Q: What is your top tip to those working in the community controlled sector for looking after their own health? Lisa Briggs: Ensure that you have an annual health check, take regular holidays and spend quality time with the ones you love, take the time to sit back and reflect on how your contribution has made a difference – you can’t look after other people if you don’t look after yourself! It’s work and life balance. 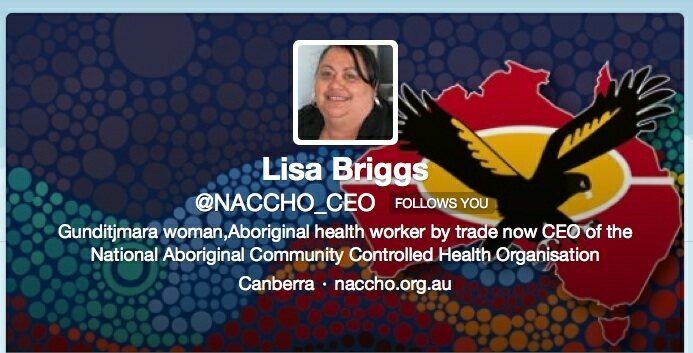 Q: NACCHO (@NACCHOAustralia has over 4,000 followers) has been at the forefront of the health sector in using Twitter and other social media channels such as blogs to communicate with its stakeholders and to build influence. Would you like to see more people in the community controlled sector using social media as a health communications channel? If so, what might help them to get on board? Lisa Briggs: This is absolutely essential, people need to be informed of the power and traction social media has – generally teaching people how to use social media or be involved is the key. We are encouraging all our member services and staff to utilise social media and can provide them with information on establishing a corporate social media policy. Once you start, you just can’t stop engaging with our community, partners, and stakeholders, sharing the issues and good news stories about the successes in our Aboriginal community controlled health sector. • The NACCHO Aboriginal Community Controlled Health Service Summit in Adelaide, August 20-22. Adelaide-based journalist John Thompson-Mills (on Twitter – @jthompsonmills) will report from the Summit. For those on Twitter, keep an eye on #NACCHOSummit. • An Australian Centre for Health Services Innovation forum, “Fixing Healthcare”, in Brisbane, August 29. Mardi Chapman (@mardidiane), a health journalist and writer based in Brisbane, will cover the forum. • The 12th Australian Palliative Care Conference, in Canberra, 3-6 September. Jennifer Doggett (@JenniferDoggett) will cover the conference. @WePublicHealth is a new rotated Twitter account that is something of an experiment in public health/citizen journalism. Every week, a different person – including community members and public health professionals – will be asked to tweet-report and investigate public health matters.